Oh dear, I felt a bed of nails approaching here when I started to read The War of the White Roses in bed. The cover photograph said it all: stone-faced Ray Illingworth, David Bairstow and Chris Old alongside a triumphant Geoffrey Boycott and above it, Yorkshire Cricket’s Civil War 1968-1986. Boycott was my childhood hero and visions of hiding underneath the duvet appeared on the cards before I had even started. 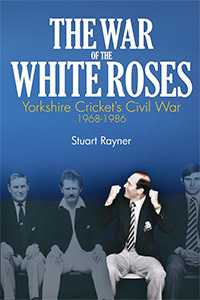 However, author Stuart Rayner is an established sports writer and this, his first book, is an impressive effort. It is also, in his own words, unbiased so the reader can take their own views and there was no need for me to keep myself buried under any number of duvets and blankets when reminded of the support of many members of the enigmatic but forthright Geoffrey. In all seriousness, though, The War of the White Roses is a fascinating account of Yorkshire’s woes since winning the 1968 Championship with Boycott predominantly as the central character. There is no doubt that he had great passion for Yorkshire cricket – like many of his colleagues – but it does show that weight of runs does not necessarily draw popularity from team members, a point I was completely unaware of as a teenager whilst standing up for Boycott. Boycott led Yorkshire for seven years during this long period of underachievement but, as a batsman, made runs aplenty and turned down England for three years to concentrate on Yorkshire. There seem to be no half measures of people’s feelings towards one of the most successful opening batsmen in the history of the game: either a like or dislike but Rayner has interviewed a broad spectrum of people whose reminiscences make for a compelling and wholly fair read. The War of the White Roses could perhaps be construed as a microcosm of part of Boycott’s life. Geoffrey, as the central character, has himself been interviewed for the book and, with all the views expressed by the various interviewees, a picture most definitely evolves of what made him the favourite of many people and what set him apart from others. One hopes that, after this initial book, Stuart Rayner will bring further books to our shelves. Time, they say, can heal wounds. Maybe illness does too as a reconciliation emerged between one of Boycott’s critics, Fred Trueman, after learning that the former had been diagnosed with throat cancer, an illness he mercifully survived and which has brought him back on to our air waves and television sets. Fast forward thirty years to 2016 and has Rayner brought out his book too early? Geoffrey, after a successful stint as President of Yorkshire C.C.C, is now trying to become a committee member but others are against the move. Is there yet more to come?